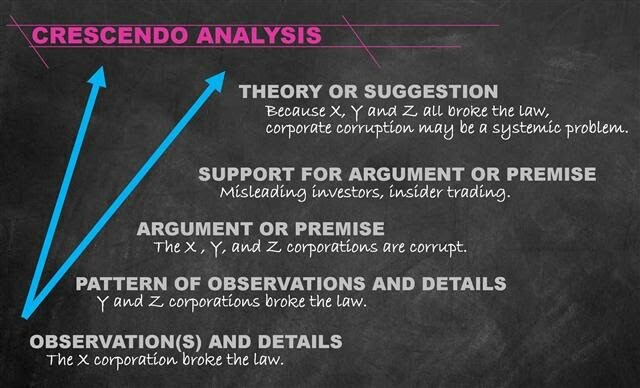 For educators, Crescendo Analysis is an effective technique in helping students avoid generalizations and broad arguments, and teaching them how to synthesize more specific information and details, leading them to a broader hypothesis, observation, interpretation or argument. For artists, Crescendo Analysis provides a connection between the micro and the macro, between the details and the message. Often, critics praise artists for their skilled and practiced ability to make details meaningful on a larger scale. 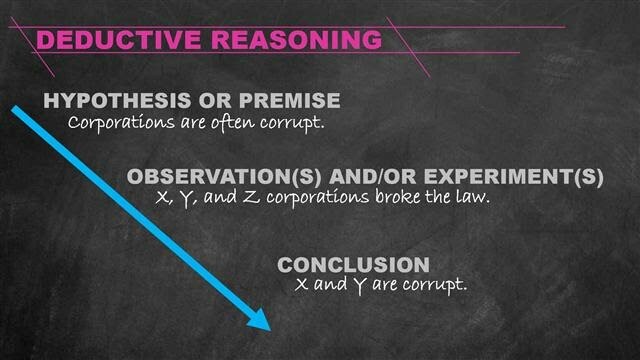 In terms of logic, deductive reasoning starts with a broad hypothesis, narrows to specific observations that support that hypothesis and concludes with a proven theory. 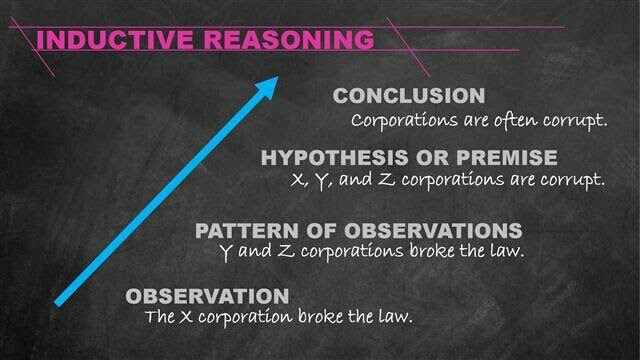 Inductive reasoning on the other hand begins with a specific observation, moves into a pattern of observations and support and concludes with the hypothesis and theory. Because inductive reasoning starts specific and become more general, Crescendo Analysis may seem synonymous with inductive reasoning. However, Crescendo Analysis is not a type of logical reasoning. Rather, it’s a way of either analyzing presented information (breaking it down) or synthesizing presented information (connecting it up). It requires both inductive and deductive reasoning. Certainly, like inductive reasoning, Crescendo Analysis or generative thinking begins with details and observations and builds out. 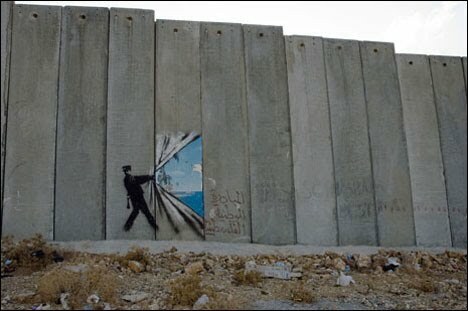 But it also involves creating an early premise based on that detail that one “tests” as he or she progresses. In An Enquiry into Human Understanding, the Eighteenth Century philosopher David Hume suggests that our sensations or “impressions” as he calls them, are the fundamental source of all our ideas. Our ideas about grapes, for example, are formed by our sensations of seeing, touching, smelling, and eating grapes. Therefore, we base most of our ideas on our own observations and experiences. Logic arrives in order to make conclusions based on what we can’t observe or predict. Because we can’t see, touch, smell and eat every grape in the world, we form certain conclusions about every grape in the world based on our experiences and observations of a select few (grapes are sweet, for example). Therefore, the way in which we experience the world stems from inductive reasoning—starting with our own individual observations and making broader conclusions based on them. Likewise the way we synthesize, analyze, and present information often follows a similar pattern. This pattern is what I call Crescendo Analysis. There is a reason that we love details, that we create art about specific individuals in very specific situations as a way to understand human beings. That is the way each of us experiences the world. It’s how we live and think. Because our goal as artists and thinkers is to bring about and explore ideas beyond the observations and experiences of our audiences, Crescendo Analysis clarifies the inductive pattern that has made the synthesize between specific details and broader ideas possible.